Bromsgrove artist Richard McIlwraith highlights the stunning art of Eric Watson. Wildlife concealed in the grasses; wildlife art secluded, unsuspected, on the first floor of Ye Olde Stables. The gaze of an animal poised in the wild; the surveying, charged inspection emanating from the eyes of the tiger drawn on Eric’s easel in his studio. There are obvious parallels between the real and the pictorial as you head deep into Canalside Craft Centre, Stoke Prior. Eric Watson is an exceptional, self-taught artist as well as the President of Redditch Art Circle and a proud naturalist and conservationist. He typically employs a unique and bold combination of pastels, pencil, acrylic, gouache and watercolour to build up a single piece. 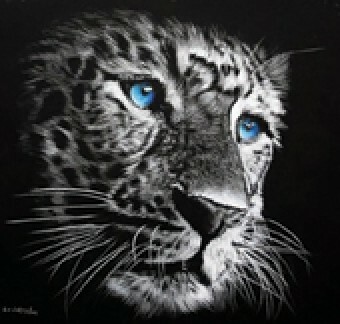 Lately, he has focused on “white on black” works of art of wild animals to achieve a particularly dramatic effect. As you see in the images, Eric displays a matchless gift for depicting the impenetrable splendour of animals. I was lucky enough to spend an hour with him last month, discussing his work and wildlife interests (including Cotswold Wildlife Park, Slimbridge Wetland Centre and the Wildlife Trust) as well as his exhibitions and classes. Eric is a humble and charming person who enjoys running his classes and workshops. He is keen to help others to look intently at the mystifying world of nature and to depict for themselves the stateliness of animals. His latest style pulses with energy and brings to life the magic of the wild. Eric is mounting a solo exhibition at Coach House Theatre, Great Malvern (Grange Road, WR14 3HA, 01684 569011) from December 11 to January 3 and I suggest strongly that you drop in to experience first-hand the power of his work. With Christmas upon us, a visit to Eric’s studio at 138 Hanbury Road (B60 4JZ) may provide you with just the right gift for that special person who loves the grandeur of animals. Original pieces are for sale along with cards and limited-edition signed giclee prints.